The insane circumstances surrounding Sly Stone's bizarre appearance in Santa Rosa last Friday, Oct. 18, were told to me by several people involved with the show. Crazy doesn't begin to describe it. Here's how it went down. The morning of the show, Sly Stone is in Los Angeles. He fires his business manager. Sly tells the promoter that he's his own boss now, that he's the one who's going to get paid at the show and that he needs $3,000 wired to the bank account of an Iranian BMW saleswoman before he'll even get on the plane to San Francisco. And about that plane: it was supposed to arrive from Los Angeles at 11:30am. No Sly. The limo waits at the airport. Sly's next flight becomes 1:30pm, then 2:30pm, 3:30pm and 5:30pm. No one can get a hold of him at all. The promoter drives to the airport in the slim hope that Sly might walk through one of the gates. Finally, at 7:30pm, with his young Japanese girlfriend in tow, the 65-year-old Sly shows up at the airport. He's an hour and a half away from the show—which starts in a half hour—and he demands to go to the hotel. The young girlfriend finally talks him out of it, and he agrees to go to the show, but he's still talking about getting paid. He sleeps all the way to Santa Rosa. Sly doesn't hit the stage at the Wells Fargo Center until 10:30pm, during the fifth song of the set. He walks off the stage 25 minutes later, in the middle of "I Wanna Take You Higher," telling the crowd, "I gotta go take a piss. I'll be right back." But Sly never comes back. The band continues on without him, killing time for 30 minutes. During the last song, a man appears on the stage, whispering into band members' ears. Meanwhile, backstage, Sly is demanding to be paid. The show is still going on, and the promoters are telling his handlers to get him back out to perform more. But his handlers know the drill. It's been this way for years. What can they do? Before the show is over, Sly is out in the parking lot, still in his white suit, trying to get into the promoter's car. All the doors are plainly locked, but he keeps trying. Finally, a woman drives by, picks him and his Japanese girlfriend up, and they whiz away. Word of his departure gets inside. It's not too hard to figure out what the man on the stage was whispering to the band. How about: Sly's making a getaway? How about: Sly's driving off right now? How about: You'd better chase after him if you want to get paid? And after quickly finishing the song and exiting the stage, that's exactly what they do. The band members pile in their cars and find Sly precisely where they thought he'd be: the Fountaingrove Hilton. Except he's not in his room. All the rooms are reserved under the business manager's name, whom Sly fired that morning. So Sly's there, fuming about not being able to get into his room, when the rest of his band suddenly pull up. "Get me out of here," he's heard telling his driver, and they peel out. It is not an uncommon sight to see cars racing down Mendocino Avenue on a Friday night. But it's a different story altogether when the lead car giving chase contains an absolute funk music legend, pursued by five more cars driven by band members, some of whom have played with him for 40 years and are actual, literal family members. Six cars race down the street, weaving in and out of lanes. Finally, past midnight, Sly's car is cornered at a gas station. A long stand-off ensues between him and the band while the young Japanese girl cries hysterically in the car. A gas station on Mendocino Avenue in Santa Rosa. That's where it all falls apart. At press time, no one can get a hold of Sly Stone—not his management, not his band mates, not his family. The last anyone sees of him, he's headed south on Highway 101. Everyone's got a pretty good idea how he's spending the money, but no one knows where he is. And no one ever wants to play with him again. 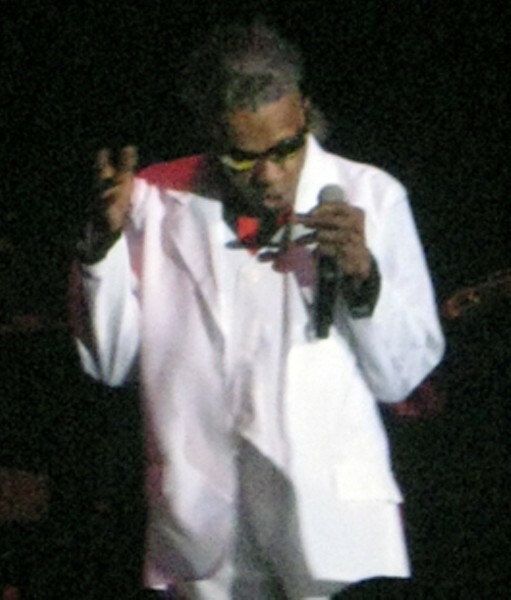 To read a review of the Sly Stone show, see [ http://www.bohemian.com/citysound ]www.bohemian.com/citysound.